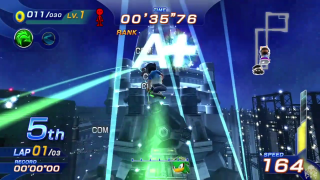 Final Factory is the seventh and final racecourse in Sonic Free Riders. Despite its name, this course is a futuristic city under a night sky with high structured buildings with lights that follow the perimeter on most of the course. The course is also the setting for the final race between Sonic the Hedgehog and Metal Sonic. This page was last edited on 5 May 2018, at 14:19.